In 1997-98 Angela Hewitt recorded a version of The Well-Tempered Clavier which dazzled the critical world and record-buying public. 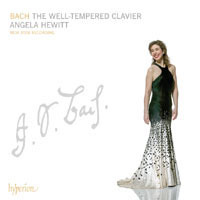 Ten years later, after her 2007-08 Bach World Tour – in which she performed the complete Well-Tempered Clavier in 58 cities in 21 countries on six continents – Angela made an entirely new recording of this monumental work. Hear the differences for yourself!